I love when Beatrice pops by for a visit. I always provide “the beverage” and she undoubtedly arrives with wedges of cheese stuffed in her pockets, a baguette under her arm. One of my favourite foodie PR gals, Beatrice is my contact for the Dairy Farmers of Canada. She’s a true lover of casein and whey and appreciates the magic they make. She recently popped by for cheese nibbles and wine sips with a hunk of Le Mont Jacob ready to be devoured. The Blackburn farm was established 80 years ago by great-grandfather Napolean and four generations later, in 2006, his descendants began producing cheese. Underground pipes which run below the street transfer the farm’s own milk to the cheese factory. 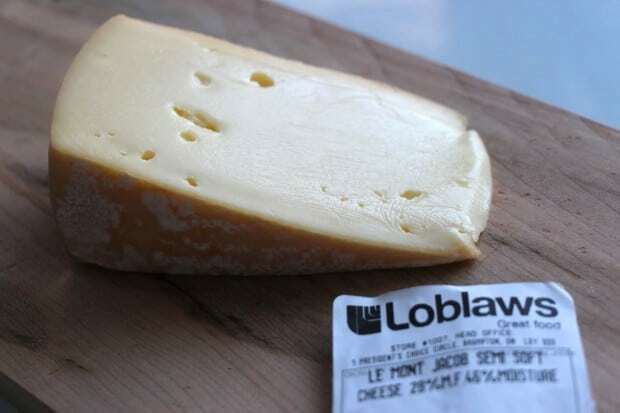 Le Mont-Jacob produced by Fromagerie Blackburn in Quebec is a semi-soft, interior-ripened cheese, with a pronounced flavour and fruity aroma. It is made using pasteurized Holstein cows milk from Jonquerie. 2.7 kg wheel’s are washed with brine for 20 days and aged 1-3 months. The 2011 washed rind winner at the Canadian Cheese Grand Prix.